“Go ahead,” Father said, and he passed me the Black Mirror. The handle was warm to the touch, and I could barely make out my reﬂection in the mirror’s polished black glass. My eyes narrowed and my lips pressed together tightly. This was not the ﬁrst time I’d gazed upon this strange black mirror. But unlike on previous occasions, I now knew what to say. I swallowed hard. “Show me my mother,” I said, and the glass burst to life in a swirl of sparkling colours. I gaped in disbelief, my heart hammering as the colours began to churn faster and faster. 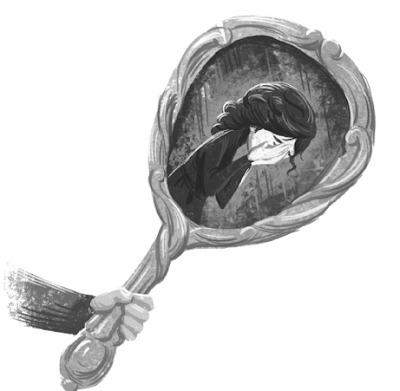 The mirror ﬂashed, and in its glass appeared the face of a woman weeping. I recognized her from the portrait in the parlour. Published by Disney Hyperion, 2016. When Grubb, an orphan and runaway chimney sweep, entered the wondrous world of the Odditorium, his life changed forever. Apprenticed to the mechanical marvel’s strange proprietor, Alistair Grim, Grubb unfortunately must settle into his new position on the lam*, as all of England is convinced that Alistair Grim is a villain. Grim, however, has come up with a plan to expose the real villain: Prince Nightshade, a wicked necromancer who wants the Odditorium’s power source for himself. With the evil prince hot on their trail, Grim, Grubb and the rest of the Odditorium’s crew embark on a perilous adventure to find the legendary sword Excalibur: the only weapon capable of penetrating Nightshade’s magical suit of armour. As expected, their quest turns out to be anything but ordinary. Not only can the Odditorium fly, but it can also swim! And so the crew battens down the hatches and sets off on an underwater voyage to the otherworldly realm of Avalon, home to Excalibur. Along the way, they must battle a banshee assassin, sea monsters, and a witch who seeks revenge on Alistair Grim for stealing her magical objects. As you can see from the title, this is the second in a series from Disney. As the cover shows, it features a steampunk submersible – which journeys from a quasi-Victorian world into the realms of legend. Lots of illustrations help the read get a grasp on the many and varied characters. Vivienne To has created an easily accessible world throughout the book. On both written and illustrated pages, the cartoon-like quality welcomes the young reader in. It’s bold and full of action – as is the plot. This is not the book for those who want subtly nuanced character portraits – it’s far too busy with underwater adventures, fun and near-misses for that. The story zips along – told by the orphan Grubb as witness to all the escapades. Characters from different legendary traditions work side-by-side to outwit the ghastly Prince Nightshade. Some of the monsters on his side may frighten very sensitive children – but there’s nothing too graphic (as you’d expect from Disney). There’s also quite a bit of quirky humour. 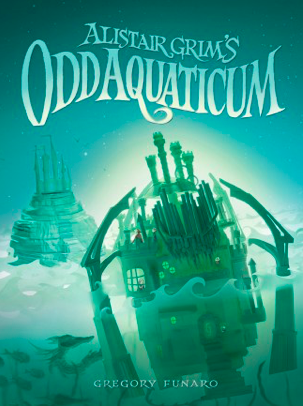 Alistair Grim's Odd Aquaticum would absolutely suit a voracious young reader who loves to imagine all sorts of strange beings and paraphernalia whilst on a fast-paced adventure.